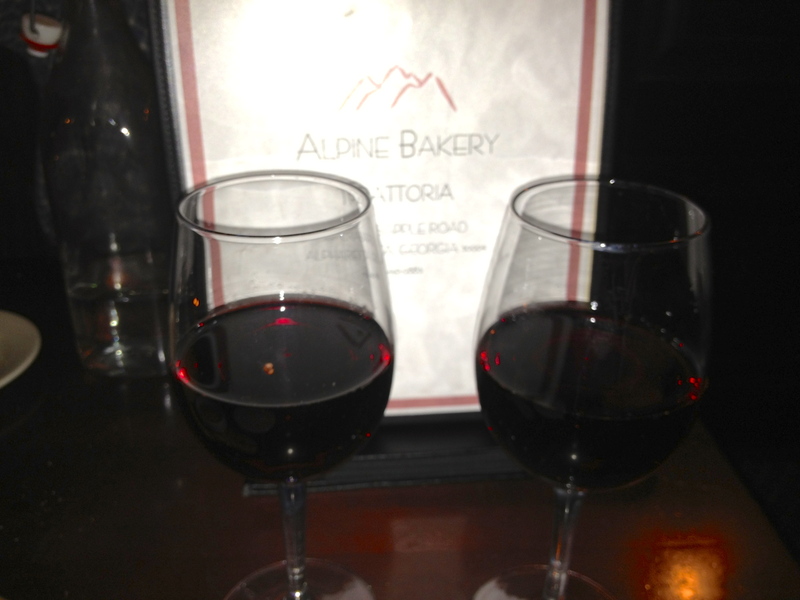 Tonight, Date Night starts hungry and rolls out of the Alpine Bakery as stuffed as a manicotti. We are in Alpharetta in a shopping center that looks a lot like every shopping center in Atlanta. Is it a bakery or a restaurant? The three old silos next door are a nice touch that make it easy to find the restaurant. Once inside, we are greeted by this display case. Oh sure…you could pick just one? The cakes cry out, “leave room for dessert!” That’s our goal, but we are about to discover, that’s easier said than done. It’s a bakery AND a restaurant. Inside, there is a lot of dark wood and marble in the decor. 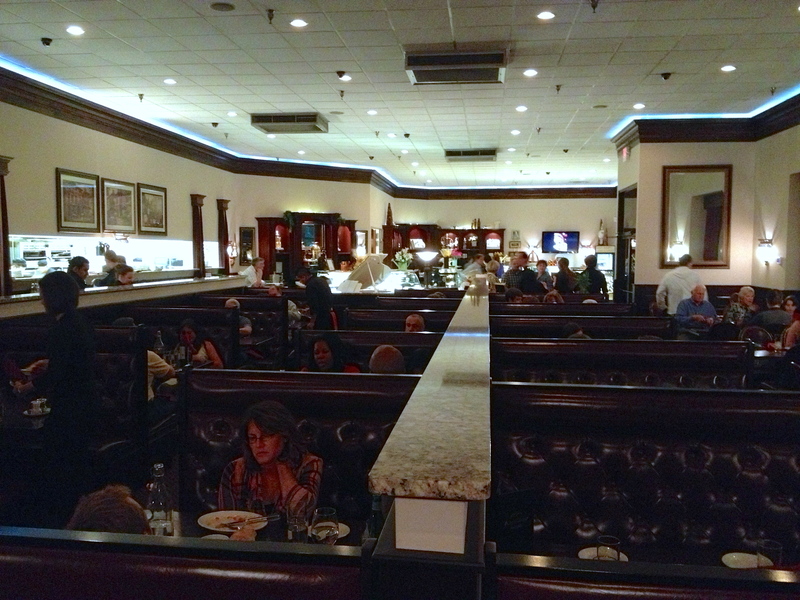 There are burgundy red booths as well as many tables for large parties. We see a full table of 10 and a table of 12, so the families obviously like the food. We are shown to table 53, which is not a booth, but affords me a nice view of the proceedings. Eve has to settle for a view of me, although I think she can see outside into Alpine’s patio area. 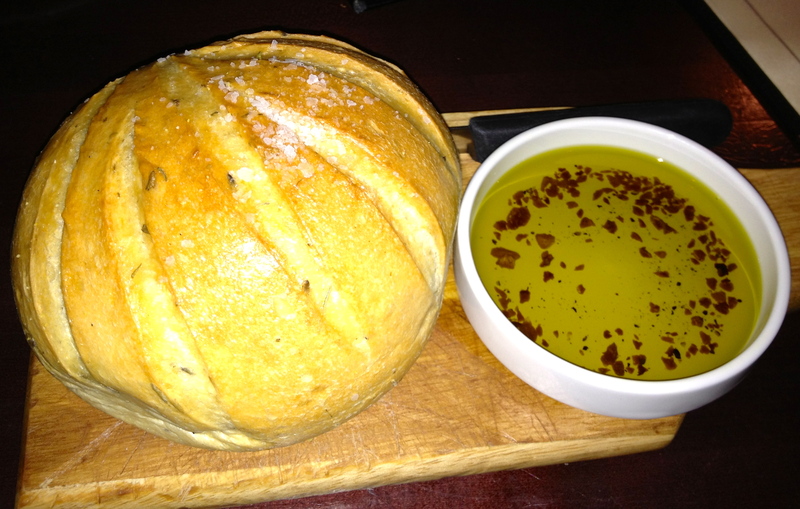 We are greeted with waters and a loaf of warm Italian bread with rosemary. There is no doubt that we could have made a meal of this loaf of bread, but we are trying to behave because we know dessert is in our future. The beer list at Alpine is not good, with Sweetwater 420 and Blue Moon as the most exotic offerings. You can go Italian with a Peroni, or you can do what we do and (surprise!) order a nice glass of Banfi Chianti. In 2010 we visited the vineyard where the grapes for this wine are grown, so we feel emotionally attached to our glasses of red. 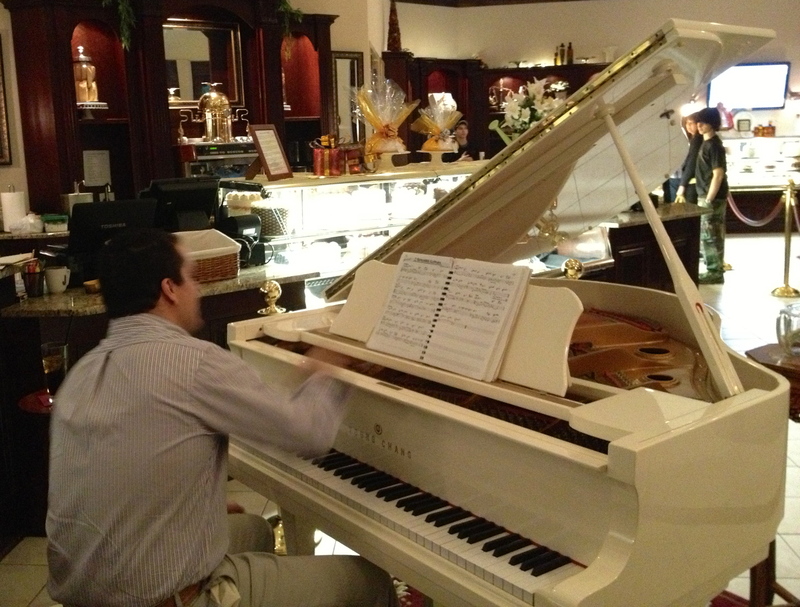 There is live piano music tonight, and in honor of the upcoming HBO Liberace movie with Michael Douglas and Matt Damon, we insert a picture of our piano player and his extravagant white piano. The soundtrack for the night. 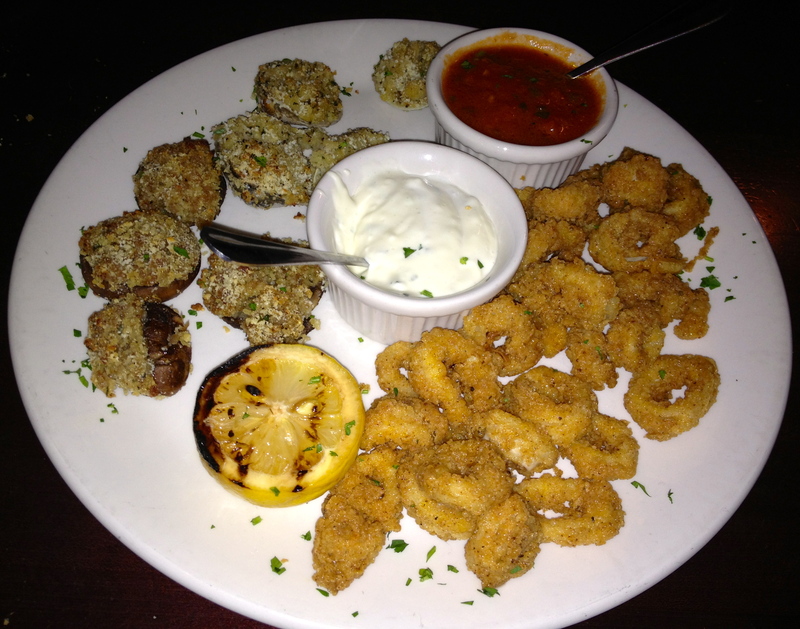 We are hungry, and decide on an appetizer sampler that gives us a good taste of the appetizer menu. We have hit the trifecta. Stuffed mushrooms have sausage in them and pack a little kick from the spicy meat. The clams are stuffed with butter and bread crumbs. And the calamari is crispy on the outside and chewy on the inside. There’s marinara and ranch sauces for dipping. Our server Heather tells us that the portions are large. We know we want to split an entree, but it’s tough to decide which one. The menu is totally Italian, with pastas, parmesans, scaloppinis, and a good seafood selection. 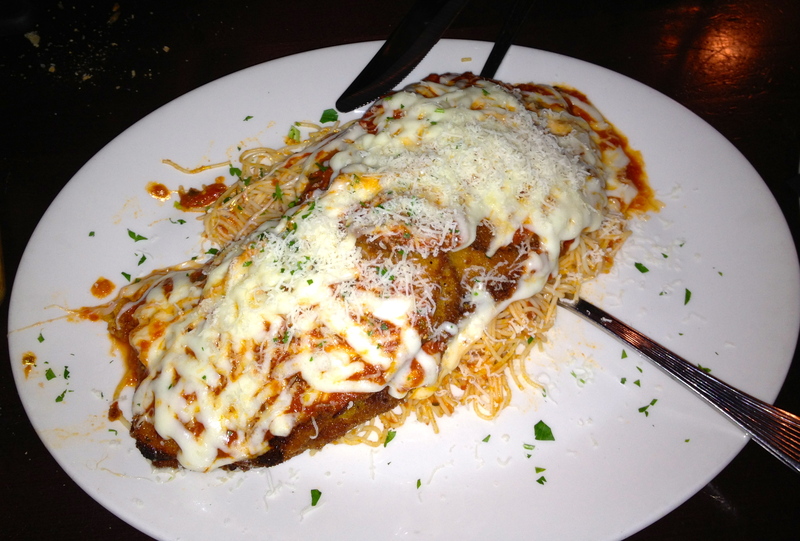 We go with the eggplant parmesan. Eggplant parmesan. Enough for 4 people! Heather is right. The plate is huge and it’s served over pasta. An interesting twist of this parmesan is the hard boiled egg slices as one of the layers. Since I like eggs on almost everything, I like the flavor it adds to the eggplant. 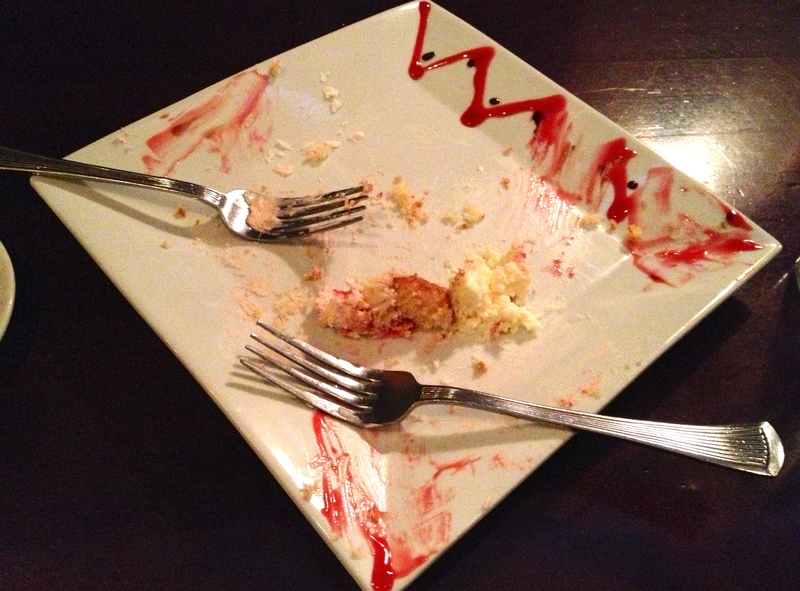 We eat the entire portion, which impresses the table next to us. It’s a lot of food, but somehow we left enough room for one of those desserts. 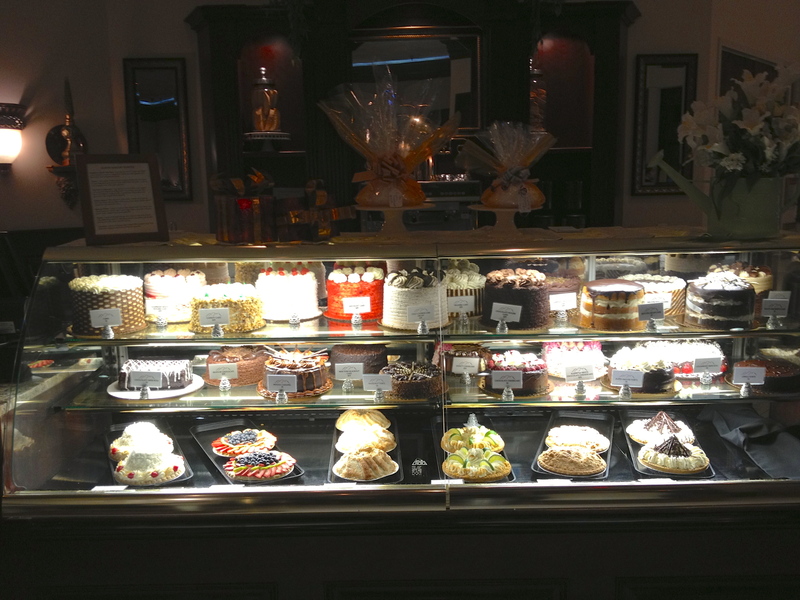 There is a dessert menu, but the best way to pick your dessert is to go “shopping” for it in the display cases. One case has whole pies and cakes that you can take home. The other case has the cakes that they are serving that night for dessert. You can go as decadent as you want, from a dessert called “The Seven Sins”, which is seven kinds of chocolate to the dessert we picked, the raspberry mousse cake. 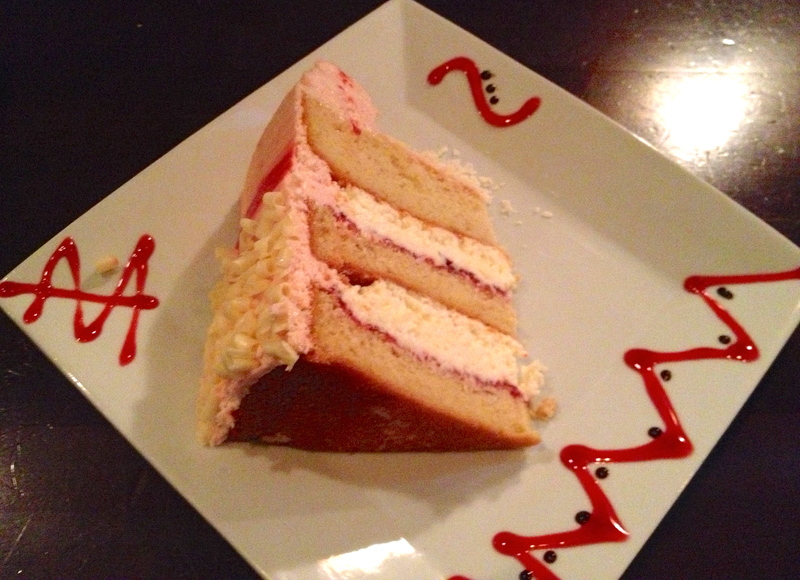 Our choice: raspberry mousse cake! It is a tough choice to make and it takes us awhile to make it, but what a dessert. Layers of white cake with white mousse and raspberry jelly, all topped off with a raspberry mousse icing. This is not as heavy as some of the chocolate desserts, but it’s a great way to end this delicious meal. The people at the next table are now our best friends as they want a bite. We don’t give them one, but we did save one for you. We saved you a bite. Believe it or not, neither of us can finish it. We are full and happy as we waddle towards the door. 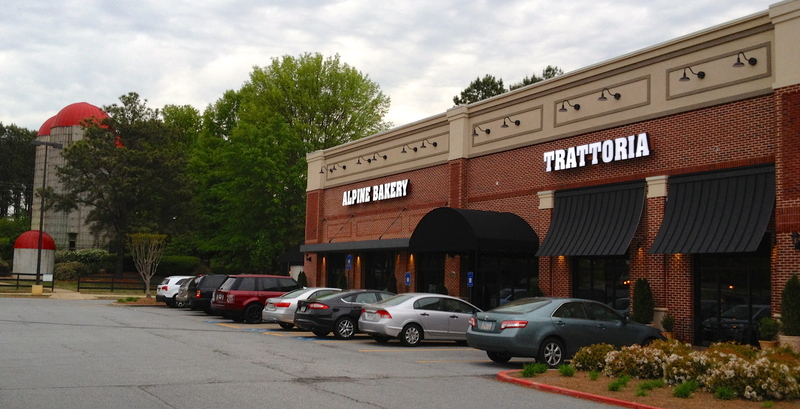 Alpine Bakery is a definite “must eat” if you are in the Alpharetta area.